If you have been searching for a unique and new dessert, look no further. Rice Pudding is commonly found throughout Asia. Although many variations with different spices added, they are traditionally made using rice and milk for main ingredients. Other common names for this dish include "rice porridge", "arroz con leche" and "arroz con dulce." 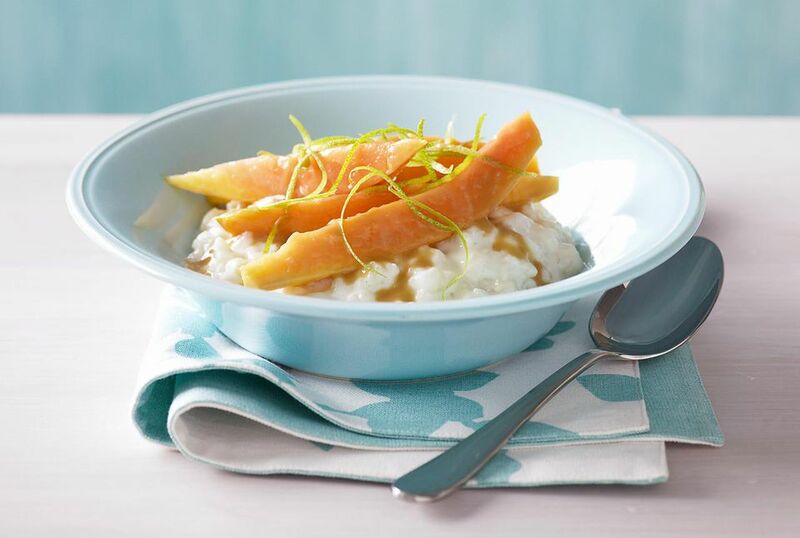 In this delicate twist, aromatic vanilla bean elevates one of the ultimate comfort foods, and makes this rice pudding ultra-soothing! Plus, this simple recipe is eggless, and can be made with milk or non-dairy substitutes, so it's a great option for vegans, or those with allergies. This recipe can also easily be doubled to provide for more guests. Bring the water to a boil in a medium saucepan. Add the rice and then quickly stir once. Return water to a boil and then reduce the heat to low and cover. Simmer the rice for 10 minutes, or until the water is absorbed. In the meantime, combine the milk and sugar, and stir to combine. When the rice has absorbed the water, pour in the milk and sugar mixture. With a small, sharp knife cut the vanilla bean in half lengthwise. Next, scrape the vanilla bean seeds out of the pod and into the mixture. then add the pod to the pot as well. Raise the heat and bring the mixture once again, back to a boil. Reduce the heat to low and simmer for a second time, stirring occasionally. Continue occasionally stirring until the rice is creamy and most of the milk is absorbed. This will take about 30 minutes. Remove the vanilla pods as to not let the flavor turn bitter. Lastly, spoon the pudding into serving dishes and allow to cool slightly. You can serve immediately or chill for 20 to 30 minutes in the refrigerator and serve cold. For toppings consider placing fresh mango cubes just before serving if desired. Other great toppings include cinnamon, shredded coconut, or blueberries. For an overloaded dessert top the vanilla rice pudding with as many toppings as you would like. To store simply place in an airtight container and store in the refrigerator for up to a week. Other variations can be made to create different flavors such as adding spices like anise seed and ginger for a more savory and powerful taste. Another alteration includes adding Saffron (only a few threads) for an earthy flavor or lemon zest to provide citrus.